BONUS OFFER: Get 100% Roulette Match Bonus! Use Code = "ROULETTE"
You would have to be living under a rock to be ignorant about The Three Stooges, the American vaudeville that pretty much defined the facial and slapstick comedy for over 5 decades. The original act was launched in the 20s by Ted Healy and Moe Howard, kicking off as “Ted Healy and His Stooges”. Larry Fine and Jerome “Curly” Howard joined the act in the 30s; by 1935, Healy was out of the picture and the remaining trio started filming for Columbia Pictures, making more than 90 movies. 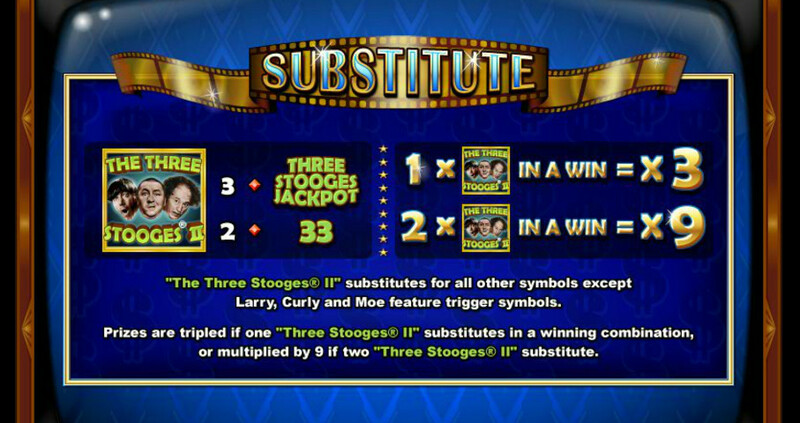 In 2012, RTG paid homage to The Stooges, launching 3×3 video slot “The Three Stooges II” with 3 paylines, followed by “The Three Stooges and the Brideless Groom” in 2016, which was based on the 1947 short comedy, “Brideless Groom”. The 2016 version was an instant success, casting a shadow over its predecessor. 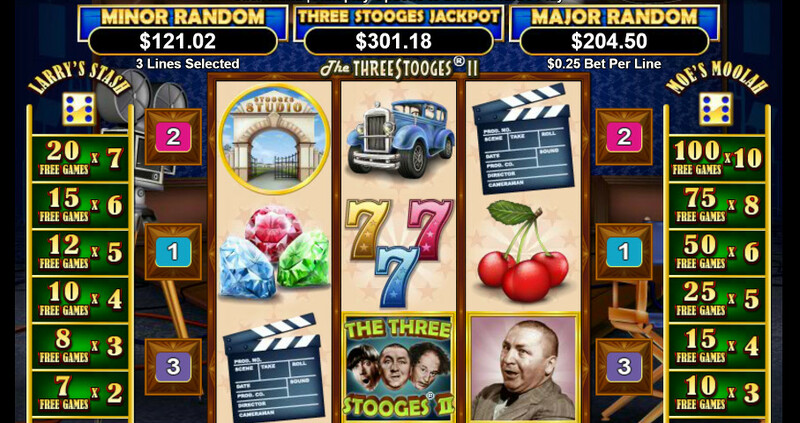 Still, the payout potential of the original release and the choice of theme make The Three Stooges II a worthy contender for a place in RTG’s hall of fame. While the new version is much more polished and visually appealing – which is not surprising considering the time span in between – the 2012 release was the one to remind us on the simpler times, when both the world and the American cinema were bashful and innocent. The Stooges are the featuring characters and the Wild symbols of the game, replacing all other icons. They can either appear as a single symbol or separately, producing mixed payouts. All payouts triggered by a combination that contains one or two Wild Stooges symbols will be multiplied by 3 or 9, respectively. 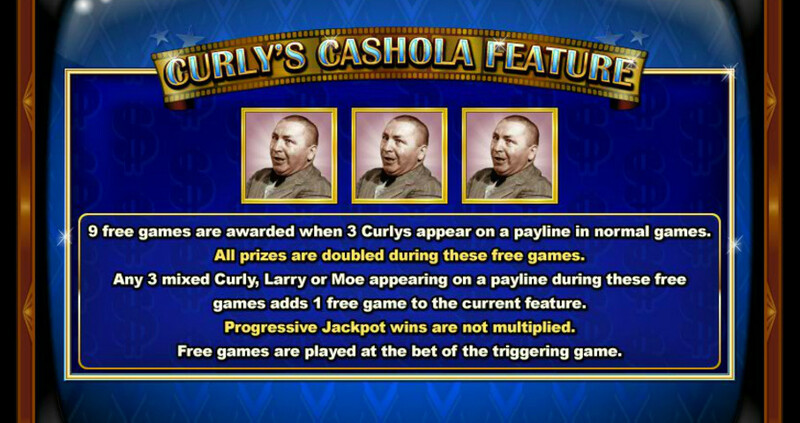 The Curly icon in the combination of 3 will trigger the Curly’s Cashola bonus, initiating 9 Free Spins. During the bonus rounds, all payouts will be doubled, and any additional Stooge symbols (each of the three characters), will add an extra game on top of the original session. 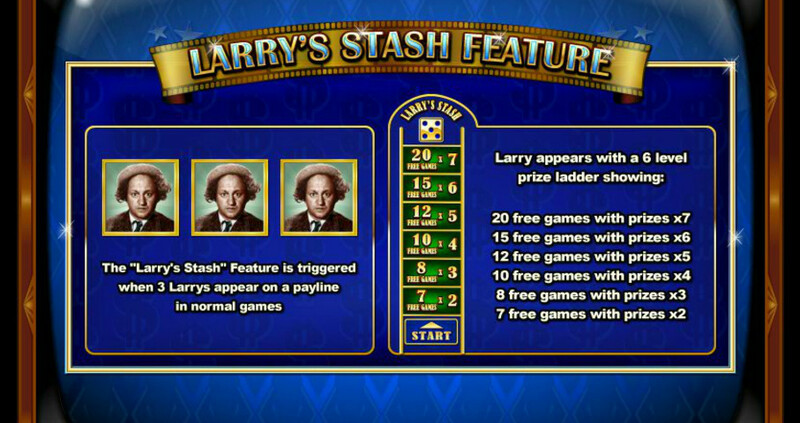 The combo of Three Larry icons will start Larry’s Stash Feature, unlocking the 6-level meter, where each stage carries a different number of bonus rounds and multipliers. To determine which of the 6 options will be activated, a dice is rolled 5 times, eliminating one of the levels with every throw. Just like with the Curly Cashola feature, news spins can be triggered if more Stooges appear on the reels. 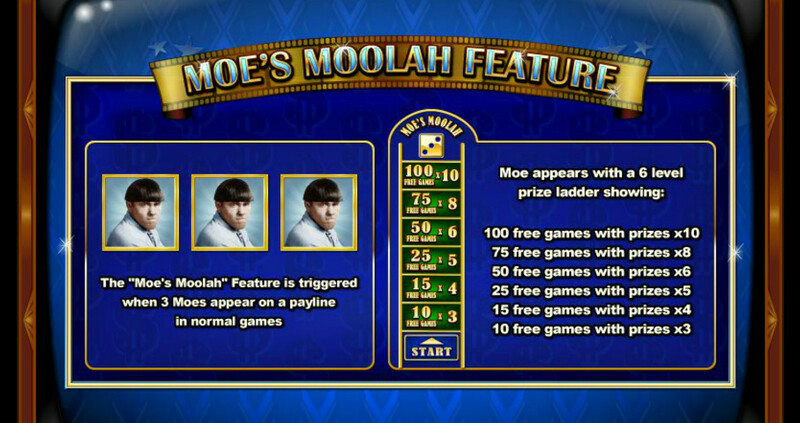 Moe’s Moolah feature is pretty much the same as the Larry’s Stash bonus, introducing the same 6-level prize meter. The number of spins is once again determined by the dice, only this time, the maximum number of the bonus round is 100, with x10 multiplier (as opposed to 20 Free Spins with x7 multiplier in Larry’s Stash). Playing The Three Stooges is a Win-Win situation! One more opportunity to cash out will pop up at the end of any bonus round that accumulates a win of up to 5x the triggering bet. In other words, even if you end up with nothing when the feature expires, you will still end up with something, thanks to the Win-Win bonus. The bet will be multiplied by 10-200 if there were no payouts during the feature or by 5-100 for wins of up to 2x one’s bet. Wins of up to 5x one’s bet will be increased by 2-100. The Three Stooges Progressive Jackpot can be won when The Three Stooges symbols land on a payline, while other jackpots (Minor and Major Random) can be randomly triggered on any spin. Perhaps not as visually appealing as some of the other games inspired by the classic America cinema, The Three Stooges can still compete with the newer releases. 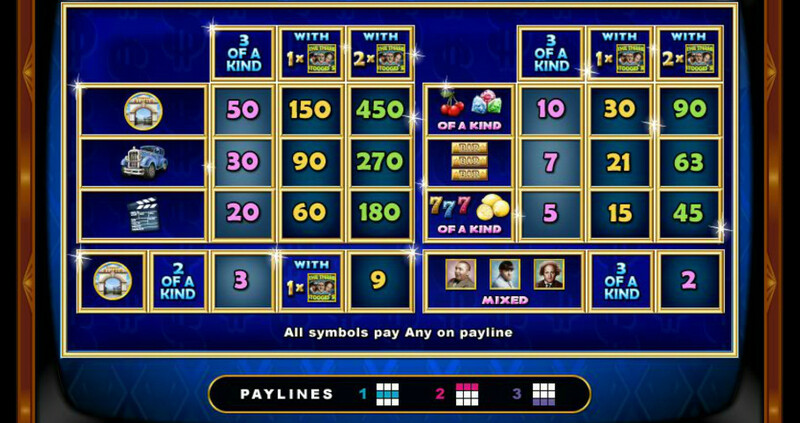 The bonus features are surprisingly elaborate and the payout potential exceptionally high thanks to the 3 progressive jackpots. The Win-Win feature is the cherry on top, offering extra winning odds just when you thought that there will be no “punch-line”.